This is a loose version of a class I previously taught called Simple Wire Crochet. It uses basic chain-stitching techniques to connect beads into a flexible and bouncy chain. 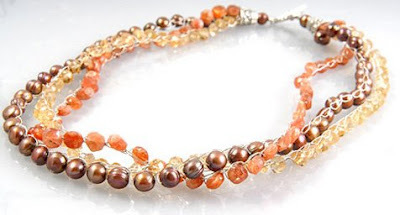 Work up several strands to make a great necklace that catches the light with every movement. A little basic wirework technique goes a long way when finishing off the necklace clasp. 1. String 12” of beads onto the wire. 2. Make a loop 4” from the end of the wire. (The hook should fit loosely inside the loop.) Secure the loop by wrapping the short wire around 2 times. Hold the hook like a pencil in the dominant hand. The beaded wire is held in the non-dominant hand. Tension is maintained by feeding the wire over the index finder. 3. Push a bead up against the hook. The chain is held with the thumb & middle finger of the non-dominant hand. This grip is used to pull the chain down as the crochet progresses. 4. Yarn Over (YO) Wrap the wire ar-ound the hook by bringing the hook under the wire from front to back. Turn the hook so that it points downward and catches the wire. 5. Pull the hook through the loop (lp) on the hook. This is the first chain stitch (ch st) made. After the first completed chain stitch (ch st): push downward, against the bead, with the thumb & middle finger for leverage when pulling the hook through a loop. Finish each strand by running the working wire through the final loop. Secure it by wrapping the wire several times around the last loop. These wraps will be hidden inside the cones. 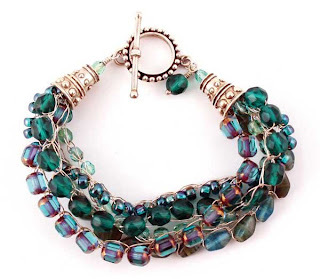 To learn more about how to make a simple loop check out Lisa Niven Kelly's website, Beaducation, to view a few free tutorials. Attach several strands together by using cones to secure and hide the crochet wire ends. 1. Using 6” of 22g wire, make a loop and string the last loop of each strand onto it. 2. Secure the loop by wire wrapping it closed. 3. Cut the wire end flush. 4. String on the cone. 5. 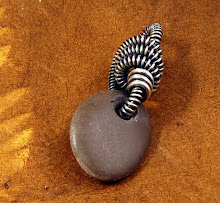 Make a wire wrapped loop, attaching the clasp before wrapping. Use a bead on the wire between the cone and the wrap to stabilize the cone. 6. Repeat the above steps to finish the second side. This blogs is absolutely amazing!!! i really liked, i think all the information contained in this blog are very useful and very interesting. i really enjoyed reading. i am very curious for everything, usually i want to know new things. this is the reason why i like to know. so, i will know more abut sink.